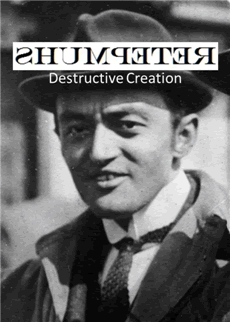 Economist Joseph Shumpeter (1883–1950) seems to have been quite a character, and I can’t help but like people that are different in positive ways. It seems that I’m not alone in liking him, since Shumpeter seem to have many followers today. And despite being kind of right wing, many left wingers seem to love this guy. Why is that so? Shumpeter is most famous for having minted the expression “creative destruction”. The idea is that in the market, new innovation makes old technologies obsolete. Hence, while new things are created, old structures are destroyed. The cars replace the buggies, and so on. This may be true, but I hardly think this is any key feature of a market economy. Nevertheless, some folks really like the idea of creative destruction. Clearly, these people don’t like the idea that a free market economy is creative, so to some degree, I think they like it because of the destructive part. They like to put the blame on the free markets when things aren’t going so well, like if it’s an inherent thing. They can blame the free markets also when their own policies creates destruction, which by the way is most of the time. However, as in so many other cases, our dear leaders get it completely backwards. They put the cart before the horse, and voilà, what do we get? We get destructive creation. You see, there’s a clear tendency among the central planning crowd to try to reverse causality. For example, already as kids we realize that if we want to harvest some crops, we have to plant some seeds. We understand that if we want to consume things, they have to be produced first. Yet, the grown-ups of the central planning variety actually believe that if we start by consuming, things will be produced. They even have a God that told them so, and the name is Keynes. That’s a major reason central planners all around the World are trying to get people to consume more, so that more will be produced. They even believe that destructive things like wars, earthquakes and tsunamis are good things for overall creation. The cart is definitely put before the horse. Similarly, the central planning crowd is so good at this backwards stuff that they actually can make a client into a liability. To most businesses, a client is a good thing and if anything, should be regarded as a great asset. Without clients, no business. We sell something, deliver, and get paid. The central planning crowd, though, they do it differently. They start by selling something, getting paid and then they are supposed to deliver. But this is the boring part, especially since you’ve already got paid. And since the central planning crowd is so good at selling, they have loads of stuff to deliver to loads of people. And voilà, all these clients are turned into a liability. Backwards, indeed. Let’s return to how they manage to turn creative destruction into destructive creation. You see, the central planning crowd, they love all kinds of social engineering. They want to remake things but in ways that are in line with their vision of a good collective. And here comes this Shumpeter guy and tells them about this thing called creative destruction. How can they use this to thier advantage? Well, with just a little twist of logic, they can destroy things and new better things will be created, they reason. So they better start destroying the bad things, and all the good things will appear, right? What can a central planning crowd achieve this way? Why not start with destroying money and see what better things will appear. They could monopolize money and let a central planning authority take care of the gradual destruction. Even if done slowly, they are likely to be able to make the money loose over 95% in value over a couple of generations. But there’s no need to go after only such big things. Why not also destroy all small things as well and remake them into something better. Like local communities, families, kids, or why not the human mind itself?! We probably can get people to not marry at all, get divorce rates booming, get all kids to lose the drive to learn things and even getting most people to get on medication because they are so confused. It shouldn’t take too long to get this destruction going, right? And what glories won’t this create?! And the best part of it? If it doesn’t work out, it must be because of the market economy! No blame on us, the almighty leaders! Destructive creation, the backwards interpretation of creative destruction, is all around us. It’s sad to think that this guy Shumpeter has to play a part in this, since he’s not really to blame. But I suppose that’s the way it works today when the central planning crowd runs things. We all become guilty; we are all dragged into the mess of destructive creation. It’s indeed sad. I wonder when we will have to throw them off their high horses.